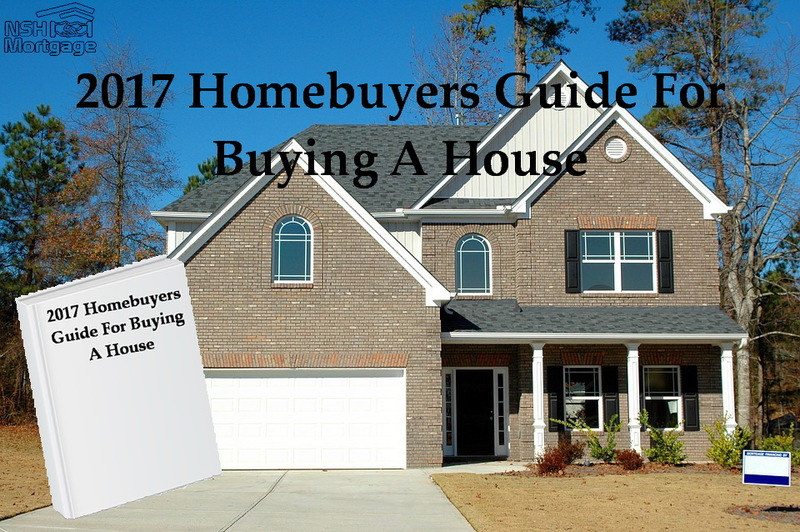 2017 Homebuyers Guide For Purchasing A House. NSH Mortgage has the knowledge and tools to help you understand the steps needed to know when buying a house. With current mortgage rates low and demand for homes high, it is a sellers’ housing market nationwide. As homebuyers you want to enter this market with as much knowledge as possible. The best ways to understand the process of buying a home is to go through it step by step. This process may vary from one buyer to the next and it may also vary slightly based on which state that you live in. The down payment required to buy a home will vary based your loan program. There are programs available with no down payment. There are also a few down payment assistance programs (DPA) available to first time homebuyers. Most first time home buyers should expect to put down anywhere from 3% to 20% of the purchase price. Note that the buyer has options to put no money down, and can put more than 20% down at any time. After saving for a down payment, buyers will have closing costs to pay on the loan. Closing costs vary by state and can add up to several thousand dollars. However, it is common for sellers to pay closing costs for a buyer. Be sure to ask your real estate agent to work that into a contract. Lastly, be mindful that some lenders may require additional cash reserves so do not expect spending everything you have on your home. Aside from putting your ability to get approved in jeopardy, it is poor financial judgment to leave yourself without money in reserve. When purchasing a home, mortgage lenders will observe your income, your assets, the down payment you have, as well as your other debts, liabilities, and obligations. It is recommended that homebuyers look for homes that cost no more than three to five times their annual household income, assuming a 20% down payment and only moderate debt besides new housing payment. Another familiar guideline is that a buyer’s total debt payments should not surpass 36 percent of their total household income, a ratio known as debt-to-income (DTI). Lenders use this guideline because it has been shown to be a level at which most borrowers can comfortably repay their mortgage, while still having money left over for life. The 36% figure is just a recommendation, while several households are able to maintain ratios in excess of 36 percent and for some households 36 percent is just too high. The best approach is to work with a mortgage professional to determine exactly what you can afford, both from a loan approval standpoint, as well as a comfort level for making the monthly payments. Before applying for a mortgage, or any other loan type it is helpful to know your credit standing. By law, you can receive one free copy of your credit report per year. Mortgage lenders will determine your credit by using the FICO scoring model. The FICO model scoring ranges from 300-850. Generally, the higher your credit score, the better loan for which you will qualify. When you receive your credit report, be sure to review it for errors and omissions. If you find something wrong, dispute it and this will start the process of removing the error from your record and may also improve your credit score. Before shopping for a home, it is important to know how much you will be able to spend actually. The best way to do this is to get pre-qualified for a mortgage. The process of getting pre-qualified involves giving out some personal and financial information to your mortgage lender, such as income and asset info, as well as information for pulling credit. Your mortgage lender will review this information and let you know how much you will be able to spend on a home. Getting pre-approved for a mortgage is more in depth than getting pre-qualified. During the pre-approval process, you will be asked for documentation which supports the information you have verbally provided as part of your pre-qualification. Documentation typically includes W-2s, paystubs, and bank statements which may include federal tax returns. A distinct advantage of completing the pre-qualification and pre-approval steps before looking for a home is that you will know in advance exactly how much you can afford. In addition to getting pre-approved also allows you to move much faster when you find the perfect home. In today’s competitive market, a pre-approval lets the sellers know your offer is serious. Not having one can weaken your bid and cause you to lose out to another buyer who has already got their financing in order. Although it is possible to search for homes using internet sites devoted to real estate, you can give yourself an immediate advantage by enlisting the services of a professional. Real estate agents have more in depth and up to date information of the communities and real estate markets that you are considering. Hiring a real estate professional is important because, if you are like most Americans, buying a home is the most expensive purchase you will make in their lifetime. A real estate agent can commonly negotiate better sales contract terms, and offer greater information on search areas. With the help of your real estate agent, you can begin touring homes in your price range. It will be helpful to take notes on the homes that you visit as it may be possible that you will view a lot of houses. Some even take pictures or videos to help them remember. In what condition are the other homes? Is there a lot of traffic on the street? How about proximity to shopping? Depending on the buyer, these examples may be or not be as important. It is still good to know what is most important to you and your family before shopping for a home. Take the necessary time to find the right home, but do not take too much time. In a sellers’ market, houses which are priced right will sell quickly. After viewing homes for a few days, chances are you will know which one or two you are serious about buying. After you find the right house, your real estate agent will help you calculate and negotiate an appropriate offer based on the value of comparable homes in the same neighborhood. Be mindful of your financial circumstances, down payment amount and closing costs when negotiating a price. Then, once you and the seller reach an agreement on the price, you will go under contract, or in escrow depending on your geographic location. After you have found a home and negotiated a sales price, there are two steps to pursue simultaneously. The first is to schedule your home inspection since they are the next step between buyer and seller after a home goes under contract. They are so common that purchase offers are typically written with a contingency clause stating that the offer is subject to a satisfactory inspection by a licensed home appraiser. Home inspections will cost between $200 to $600, depending on the size and age of the home and should be performed by a licensed home inspector who will be impartial to the inspection’s outcome. Licensed home inspectors are trained to look for flaws in a house which you, or your real estate agent, may have missed including faulty electrical wiring, building code violations, roof issues, and other health or safety hazards. A thorough inspection will take anywhere from two to eight hours to complete. Several days after the inspection, the licensed inspectors will provide to you a report which details the home’s system and structure. Expect for the report will note deficiencies. It will then be your choice whether to ask the seller to remedy the deficiencies found. If the seller agrees to make repairs you will have an opportunity to walk-thru the home before closing to ensure all repairs were made, as agreed. Inspections should be performed on all homes even newly-built ones. An appraisal is an opinion of value from a licensed real estate appraiser who visits the home and inspects its size, condition, function, and quality. First, an appraiser comes out to the property and inspects the home. Next, the appraiser researches similar homes in the area and compares recent sales to determine a fair market value. The appraiser then gives a final appraisal report which includes a final opinion of value. A real estate appraisal helps to establish a home’s market value the expected price it would fetch if offered in an open, competitive real estate market. Appraisals can help buyers ensure that they do not overpay for a home. By law, mortgage companies cannot complete their own appraisals so many hire an appraisal management company (AMC) to handle work which, in turn, gives the work to a licensed professional appraiser. The appraisal must be performed by a third party who has no interest in the outcome of the appraisal. When you submit a loan to your lender, it is known as going into underwriting. The term underwriting refers to the process that leads to a final loan approval or denial. A loan’s approval status is made by a professional underwriter which uses specialized software programs and number-crunching analysis. Once an underwriter has reviewed all mortgage applicants information and documentation, a decision will be made on the loan’s status. There are a few possible outcomes at this point. Most loan applications are approved with conditions. This means that the loan is approved, so long as the borrower provides additional, clarifying information. Conditions typically fall into three categories: explanation and correction of anomalies, verifications and attestations, and supplementary documentation. Explanation and Correction of Anomalies refers to inconsistencies in a credit reports; and may include official explanations of out-of-the-ordinary pay stubs, tax statements, and wages. Verifications and Attestations include verifying a borrower’s income, employment, housing history, and gift funds, when applicable. Lastly, supplementary documentation requests may include clarification on credit profile items, profit-and-loss statements from a business, and tax-related documents. Once your home inspection is complete and your loan is underwriting, it is time to get started with your homeowners insurance policy. Known officially as hazard insurance, homeowners insurance is a requirement of your loan approval. Lenders want to be sure that your home can rebuilt to its same specifications if damage occurs, and will not approve your home loan until such a policy is in place. You shop for your hazard insurance, knowing that quoted premiums will vary by insurer based on the age of the home, its construction type, its proximity to services such as police and fire departments, and your deductible amount. You will be asked to show proof that your policy is in effect as of your closing date. Many insurance policies are pre-written, and made effective payments on the first year’s premium, which typically occurs at closing, not before. After a file has been fully underwritten and all the conditions are satisfactorily met, a final underwriting approval will be issued. This is known as a Clear to Close. Clear to Close means that the documentation you provided to your lender have met their approval, and that no additional paperwork is required. When you use Clear to Close, your lender is ready to fund your loan and will begin communicating with the closing agent to prepare your documentation for closing. Depending on where you live, closing on a home goes by different names. In many states, it is simply known as closing. In other states, notably California, closing is often called going to escrow and is also known as a settlement. Regardless of what you call it closing is the last step before getting the keys to your new home. It is the legal process by which ownership of a home moves from one person to another, as a deed. Closing is a relatively simple process. In advance, all the necessary paperwork for signature will have been delivered by your lender, and your final Settlement Statement, called the HUD-1 which mirrors the preliminary settlement statement which was sent to you in advance. Often, closing is just the formality of sealing the deal. Sometimes the seller is there an agent for the seller there. Your real estate agent may be there, too, as may your lender. Closings can take anywhere from 25 minutes to two hours, depending on the complexity of the transaction.